This sketch was executed with pencil on white paper out in my yard and scanned to my MacBook. I reversed the color and labeled it in GIMP. This sketch was rendered when the comet was almost at its brightest in the constellation Eridanus. Although many observers didn’t see the tail as readily as this sketch reveals, I found that I could see it better with averted vision. SkySafari ranked it at a magnitude 5 at that time. In my notes I pointed out three stars almost in a line running west to east and two more further east on a NE to ENE axis, one of which is Struve 536, a double star with a separation of only 1.5 arc seconds. ZI Eri at magnitude 5.2 is to the NNE in line with the tail of the comet. As noted, I used a 2″ Explore Scientific 18mm eyepiece with no filter on a Vixen 104mm refractor. I noted a Transparency of 2 – 3 out of 5 and a Seeing of 4 out of 10. The moon was nearly full in Cancer and low in the east at the time. This is a very interesting and fine capture of Q2(Lovejoy) at its brightest! You have also captured the “faint” tail! 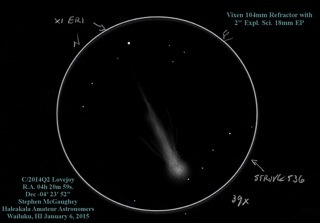 Great sketch and observation of Lovejoy C/2014 Q2 and surrounding star field. I also like how its displayed with the blue lettering. Nice details all around.